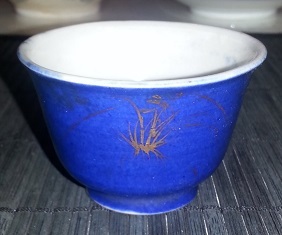 Natural light photos of the little blue tea cup posted below. 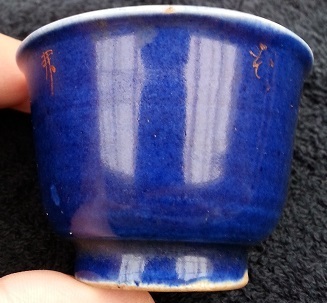 Here are some more photos in natural light of the little blue tea cup I have posted about below. thanks for your input guys. 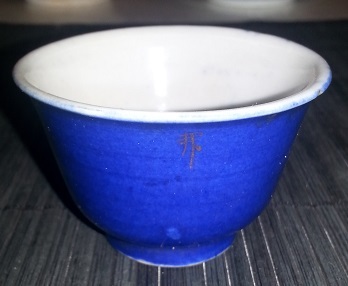 Comments for Natural light photos of the little blue tea cup posted below. 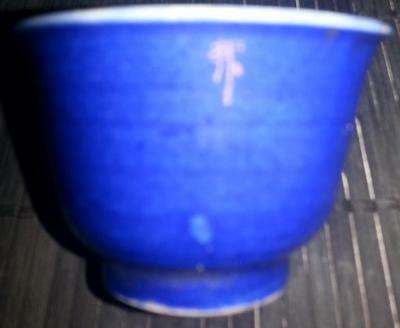 if that is the case and it is a japenese cup where abouts is the kiln it was made and what sort of age are we looking at. 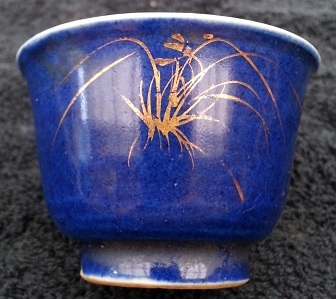 I really like this little cup it is one of my favourites and seems as if it is of some quality so the more info I can get on this little one the better. also what is the difference that you can see that makes this japanese and not chinese. does amybody else have any theories on this cup or some info to add??? cheers guys, I really appreciate your input and time. it is all a learning curv for me. You could be right, Sal. I must say that I do not recognize this shape, especially the foot, as being Chinese. 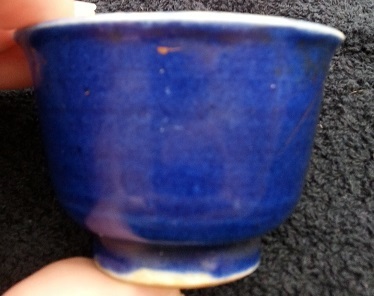 The second lot of photos is of a small tea cup which has gold gilt painting and a deep blue to it. it has three characters in gold gilt around the top outer edge and a gold gilt painting of a plant. 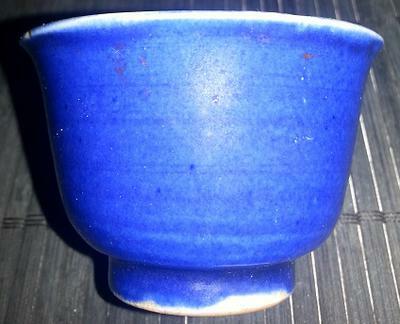 The post with the extra natural light pictures that I posted earlier today is down the bottom of the blog page and is titled - Natural light photos of the little blue tea cup posted below. 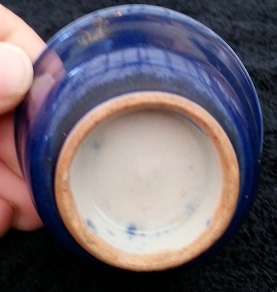 There is also another post of mine that has ended up way down the bottom of the blog page and is also titled - Identification of several pieces and marks including dates. Your help is appreciated. no 7. Will look for them. This forum system has a problem. Once the posts are around 500, the unanswered ones aren't moving to top for some reason. It will come up as soon as there is a comment. Pictures should be taken in natural lighting, perhaps near a window, to allow for natural colors. Here the colors are too bright from artificial lighting. A bottom picture should always be added.